I wasn’t intending on writing a report of this gig but as it was notable for a number of different reasons I think it is more than worth a few words, if only to direct listeners to some young bands from the Cardiff area that they would otherwise probably not encounter. As it was not planned there are no photos (which is a good thing given my track record!) but I have included video clips from other recent shows to give the uninitiated a small idea of what they missed. His Naked Torso is certainly a name that conjures images but none that are likely to describe the music that the duo produce, unless the torso in question is bloodied and battered at the bottom of a particularly tricky staircase. Featuring guitar with drums and keys (often played concurrently by the drummer, both drumsticks in one hand) they make a semi-improvised and squally noise that is very entertaining. Tunes they don’t have in abundance but they were certainly the most experimental band on the bill and some of the ideas are very good. With lashings of youthful energy behind the cathartic music they were well worth seeing. The band member quotient increased two-fold with Fist Of The First Men; bass, drums and two guitars. This set the tone for the evening as each band was markedly different from the last whilst remaining within the same ballpark. The guitars made a fine racket, speedy picking in unison a speciality, but the bass is what made it for me. I spent much of the set watching full pints of beer on the table next to me bounce merrily towards the edge and certain oblivion with each pounding bass note. There were times where I thought I might soil myself, the notes pitched perfectly to render bowel control useless, but fortunately I managed to retain a semblance of decency as the bass continued to rattle the ribcage and thump the gut in a most enjoyable way – this makes me sound like some kind of masochist but, honestly, it isn’t like that… A great take on the noise genre delivered with style, confidence and plenty of variety within the ideas, Fist Of The First Men were probably my favourite non-Japanese band of the evening. By this time the venue was really busy, I’d guess a couple of hundred people and the most striking thing was that the average age was probably in the 20s and around 30% female, and not the sort who have been dragged along by their other halves but really into the music which was often ‘difficult’ to say the least. This could be the result of the venue itself being the draw and the punters being open enough to try any style that is presented to them but it seemed that all present knew what they were in for and weren’t remotely shocked by it! The eternal question; how to attract all these eager gig-goers to other shows which are often majorly under-attended? It may have something to do with the age of the bands as the first three were all pretty young, however the main act are clearly middle-aged and the crowd lapped them up so it isn’t necessarily an age thing. Therefore, it must be the music, plain and simple, and that is surely the key – get people to listen and they will come. Another change of tone with third band of the night, quartet Them Squirrels, as twinkling twin guitars and occasional violin made an impression, the sound often morphing from quaint melody into thrashing noise. There appears to be more Alt to this band than the others but another entertaining and energetic performance that was enthusiastically received by a now packed Clwb audience. And so the main attraction finally get to set up. 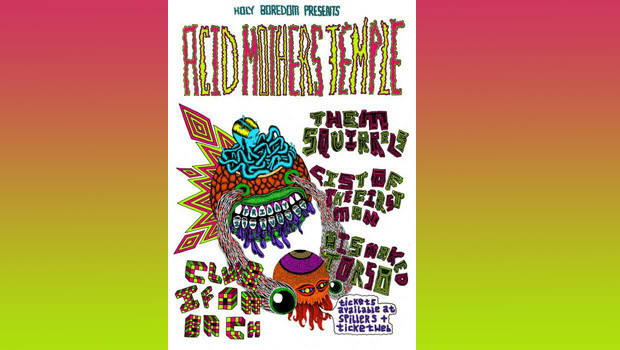 As with all the change overs, they were quick and efficient and it wasn’t long before Acid Mothers Temple were ready to go, well after the anticipated time but no matter, it was always going to be ambitious to cram in four bands between the advertised 8 and 11 pm. Having seen AMT previously in a duo format of leader guitarist Kawabata Makoto with drummer extraordinaire Tatsuya Yoshida this was my first taste of the Melting Paraiso UFO incarnation. What kind of noise would these five hairy Japanese gentlemen of a certain age make? The answer is soon clear – INTENSE! If ever a band was well named then this is it – you get exactly what you’d expect. These are no shrinking violets when it comes to a forthright display of power, the drive coming from the rhythm section with bassist Tsuyama Atsushi particularly noteworthy, his flights up and down the neck of his instrument reminding me of the style often deployed in the ’60s and ’70s; dextrous and free-flowing as a counterpoint to the howling storm around him. The legendary Makoto was at the heart of everything his guitar picking out the direction and providing the focus, ably supported by second guitarist Tabata Mitsuru as they set up a flailing soundscape of high powered guitar riffing very much influenced by Hawkwind but then progressed via all kinds of other genres. Stage centre, long grey hair swirling around like an oriental Gandalf, stood the enigmatic and serene Higashi Hiroshi, the lynchpin in sending this joyous craft into space, his swooping, whooshing and bleeping synth adding that extra something that all good Spacerock should possess. Most of the set was solid in-yer-face Spacerock but they also worked through some Blues orientated pieces and some manifestly Japanese material including throat singing and recorder from bassist Atsushi. Throughout the mostly instrumental set were songs sung in I’m not sure what language but it didn’t really matter anyway as most built gradually through repetitive mantras to deafening crescendos, from simple beginnings of pleasant phrases and melodies to howling cacophony and back, sometimes a number of times within each song. The control was extraordinary and the way the songs shifted gear took the breath away. At times, as noted, the intensity was such that I could see drummer Shimura Koji flailing away pounding his kit but couldn’t actually hear what he played, the all-encompassing and visceral shitstorm around it rendering it indiscernible. There was plenty of dancing amongst the crowd and I could imagine this being the best night of my life if it was 1970 and I had some good acid with me. Quite a show, simple in many ways but supremely satisfying with material that is always going to work best in a live environment. And that was it. Midnight and I stumbled out into the still damp night, my head ringing in a way it never has before. Walking back to the car I became aware that I could not hear anything that those I passed were saying – it’s just noise – and the splashing tyres of passing cars created a static hissing effect in my ears. This was quite disturbing. Back in the car I had to turn the CD off as it just made no sense, my ears unable to interpret anything. The long drive home was quite uncomfortable and I’m kind of disorientated, things I expected to hear sound weird or I don’t hear them at all. Back home the silence of the house was deafening, the slightest noise clangs like a bell in my head and I’m fearful that this is the gig that has pushed my already dodgy ears over the edge. Dealing with mild tinnitus is one thing but a dramatic hearing shift is not going to be good. Maybe now is the time for plugs.